On the end of the Zlatni Rt peninsula, just south from Rovinj inside the forrest park, you can find one of the most popular climbing areas in Istria. 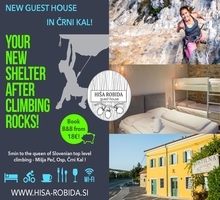 It is close to the sea, family friendly, perfect for climbing schools and has a beautiful view of the whole old town of Rovinj and beautiful Adriatic sea,… More then enough reasons to visit this popular crag. From the highway Pula – Buje take the exit Rovinj/Kanfanar and continue to Rovinj. You have to reach far south part of Rovinj where you have to pass a big hotel resort (Hotel Eden) on your right. Continue that road and about 50 meters before the roundabout on a big parking lot you can park your car and walk for 15 minutes in the right direction to the coastline. Follow the coast to the south. You will see the faces on the beach and a little higher up on your left side. This is an all year round climbing area. The best seasons are for sure spring and autumn. In winter you can climb in the afternoon sun, while in summer you can climb only till 1PM when the walls are still in shade. 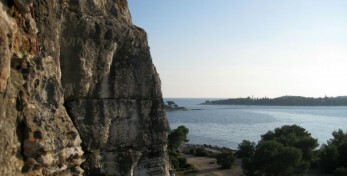 After climbing it is recommended to swim in the beautiful Adriatic sea. The place where the crag is situated was once a quarry providing stone for Venetian palaces. The rock is of good quality and the routes are nicely bolted and friendly for beginners, families and recreational climbers. As the routes are pretty short you will need a 50 meters rope and about 10 quickdraws. 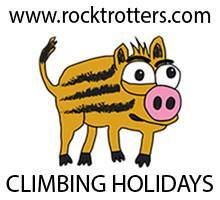 The routes are up to 20 meters long on white-grey firm limestone, vertical and fairly sharp. 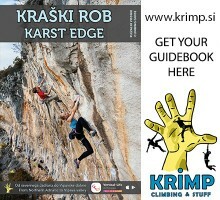 The holds are different, from edges to pockets, slopers, tufas and jugs. Climbing varies from technical style to bouldery sections where finger power is needed. Rovinj is a nice city really worth a visit, a drink or a dinner or maybe just a relaxing evening walk.